What kind of Queen will you be? You can decide later whether you want to be cruel or kind, but one thing is definite...you will be stylish in this Queen of Wonderland Costume! Frumpy Alice has nothing on your sleek sophistication. Call in Tweedledee and Tweedledum to fetch you your croquet stick. You have a match to win! The ruling Queen of Wonderland is not one to lose anything, so you’ll be sure to get whatever it is you wish when you wear this modern take on the classic Queen’s dress. While taking off people’s heads simply for disagreeing with you may be going a bit too far, we think the Queen is entitled to rule her kingdom any way that she wishes. Wouldn’t you agree? 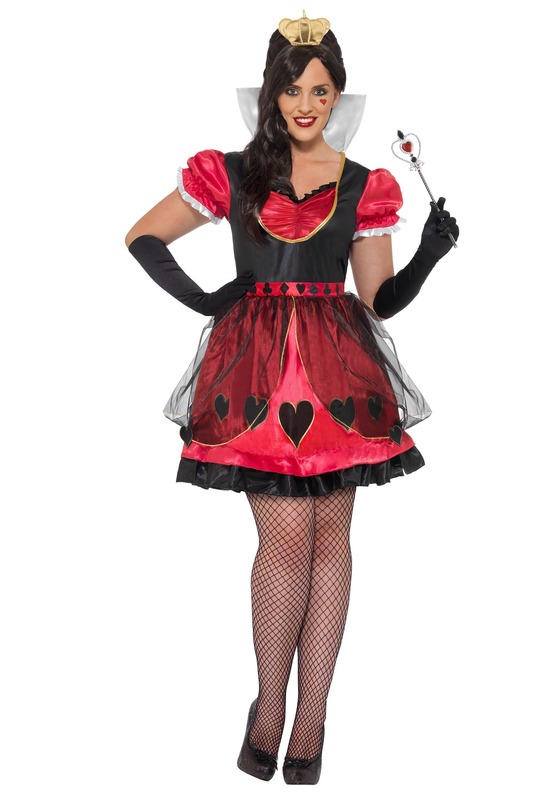 This Queen of Wonderland costume dress is made of a poly/nylon blend so you know it will be comfortable enough to wear all night. The dress can be pulled over your head for easy on and off and the back has an elastic waistband for added comfort. The built-in petticoat gives it just the right amount of volume to really help you make an entrance. The bodice of the dress has all of the beautiful embellishments you’ve come to expect including short, puffy sleeves, sweetheart neckline, and stand-up foam collar. This women’s plus size costume also comes with a wide red, satin bow attached at the back and a gold fabric crown that secures in place with the attached headband. Get ready to rule Wonderland with an iron fist this Halloween! This costume is true to size. I'm a 16 and ordered it in a 1X. The costume looks just like it does in the picture. I'll probably wear it with tights instead of gloves.